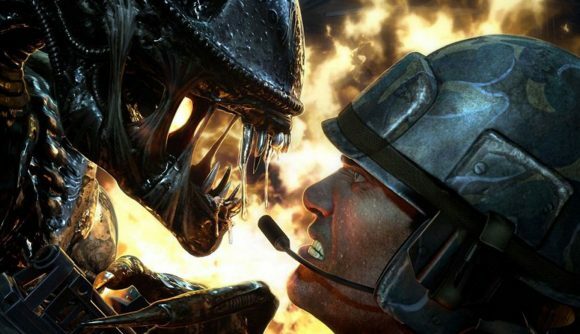 We’re not sure what upsets us more – that we didn’t get Obsidian’s Aliens Crucible, an ambitious third-person Aliens RPG from the creators of Fallout: New Vegas, or that we got Aliens: Colonial Marines instead. Now writer Chris Avellone has shared some previously unrevealed details about Obsidian’s cancelled RPG – including the tantalizing description of it as “Mass Effect but more terrifying”. Aliens: Crucible was cancelled by SEGA shortly after the disappointing release of Alpha Protocol. As Obsidian’s interesting but flawed spy RPG was also published by SEGA, where upon release it received disappointing reviews and poor sales, it’s perhaps hardly surprising that the publisher wasn’t willing to cooperate with Obsidian on another project. Avellone particularly notes that, while he’s disappointed the game didn’t happen, he doesn’t blame SEGA for the game’s cancellations – instead he suggests that “the publisher/management relations had gotten to a point where they were just tired of dealing with [Obsidian].” Which is sad, because as Avellone says, “it was shaping up to be a really cool game” – with a few ideas that Ridley Scott’s Alien prequel Prometheus would later attempt. We’ve heard relatively little about Aliens Crucible in the ten or so years since it was cancelled, although it was supposedly almost ready to ship, and at least had good xenomorph animation. Aliens: Colonial Marines, on the other hand, was so bad it was allowed to ship with the Aliens broken by a typo in the game’s code. We know which one we would’ve preferred, anyway.